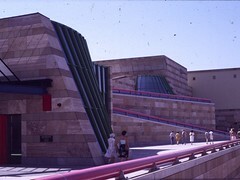 Views of Stirling’s Staatsgalerie tend to show the front of the building with its extraordinary denial of the conventional facade in favour of an array of architectural motifs grounded in a stylised ruin – the approach from Konrad-Adenauer-Strasse invites the visitor to immediately enter or to climb the building. A visit in 1984 soon after the opening of the building was quite different. The hostel was on a hill side and we made our way down to the city centre by foot, encountering the Weissenhof-style administration building first and using the path via the building’s rotunda as a route between the hillside and the city below. This powerfully linked the promenade through the building with the surrounding landscape and we experienced Stirling’s architecture as an easygoing down-hill short-cut – a series of experiences in which the building never fully presented itself. View the Staatsgalerie Slideshow 1984-1990. The coastline of Britain, longer for dogs than men. 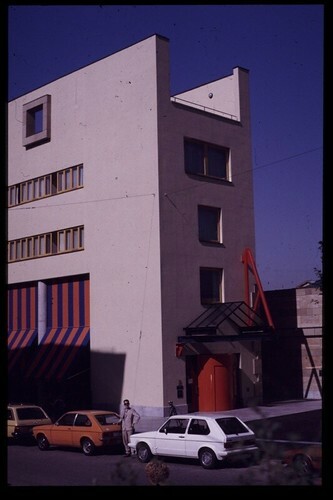 In 1999 the Canadian Centre for Architecture in Montreal purchased the archive of James Stirling and Michael Wilford’s office, including much material from Stirling’s previous architectural firms. In the linked edition of MOQDOC (a Canadian newsletter for art libraries and archives) the cataloguer Eva-Marie Neumann outlines the archive’s contents and some of its unexpected material which will shortly become available to researchers. CiA staffer Eamonn Canniffe and his co-author Peter Blundell Jones get a four star review from Alan Powers in this week’s Building Design for Modern Architecture Through Case Studies 1945-1990. CLICK for the full review in BD Online. Other Books by Us. The External Examiners are in so these are just snatched photos of this year’s CiA Bachelor of Architecture show. The exhibition (in colour!) opens at 6pm tomorrow (Friday 15 June 2007) on the fifth floor of the Chatham Building. See you there. LINK to details of the Faculty of Art & Design Exhibitions including maps and times of opening. Continuity in Architecture’s academic year draws to a close with the submission of final projects and this final film record of Year 5’s MOdAM proposals for a Museum and School of Fashion. In the next academic year students will embark on their own thesis design projects in Milan. Doris Lockhart Saatchi has written about the artist Ben Johnson and his encounter with James Stirling. Perhaps Johnson’s 1986 painting of the galleries of the Staatsgalerie in Stuttgart rebalanced the equation? Steve Cadman has produced an excellent photo set of Leicester buildings. View the Leicester architecture slide-show at fast speed and see Stirling’s Leicester Engineering Building in the context of the vigorous and eclectic architecture of the city. * Ian Brown in Architectural Forum April 1972, quoted in James Stirling, Buildings and Projects 1950-1974 Introduction by John Jacobus, Layout by Leon Krier and James Stirling. Our recent post about Evora has led to some interesting correspondence with Portuguese architects and students. rui-mello sends us some images of the work of Joaquim Massena. The project is a theatre in Oporto. The work of Massena, which appears to be a mixture of new buildings and renovation projects can be found at www.joaquimmassena.com. After recent intermittent or even timid architectural interventions in wineries in the Douro region, this completely new project in the Alentejo brings a practice to national wine production that is beginning to be common in the wineries of countries like Spain, France, Italy and the United States, in which wine production and commercialization start with the buildings themselves, contributing added value, giving them their own identity, beyond creating a more efficient system of production. The return on investment also translates in the marketing of the wine production itself, providing it with an image that coincides with the cult of wine.